It has been a very busy weekend for me with many celebrations and genealogical connections. On Saturday, I had the pleasure of presenting two sessions at the Houston Family Genealogy Day sponsored by The Church of Jesus Christ of Latter-day Saints. My class handouts for the both the Irish and Scottish session are posted here. In addition, there are handouts from several of the other presenters that are profiled here. Irish Genealogy- NOT ALL THE RECORDS BURNED! I acquired a wealth of material for future blog posts over the course of the weekend not the least of which was my Father's Day visit to the new Bryan Museum in Galveston. The Bryan Museum is a MUST SEE historical and artisitic attraction. My family was on the first tour of the day yesterday, which was led by the Bryan Museum curator. The tour also included a drop-in by Mr. J.P. Bryan who highlighted some of his favorite pieces in the collection. The Changing Gallery features a special exhibition honoring the Buffalo Soldiers of the 9th and 10th U.S. Cavalry to mark the occasion of the 150th Anniversary of Juneteenth. This exhibit will run through Labor Day but visit the museum soon and visit often. I have also been having a lot of fun with a product called the Simply Fun Conversation Ring. Each ring contains 98 question cards with a variety of conversation starters. It can be used two ways, ask questions to each other or predict how the other will answer the question. Compact, sturdy cards on a ring go anywhere. Great to keep in your purse, car, on coffee or dinner table, etc. Questions cover a variety of topics that are great for children and adults. Great for: car trips, sports activities, waiting in line, hospital or nursing home visits, classrooms, gift toppers, around the kitchen table, at a restaurant, family reunions & gatherings, small group activities. One of the questions was about the most beautiful place that we had every visited and Lake Tahoe was on the top of my list. Coincidentally, my sister was also waxing poetic about Tahoe on Facebook. My siblings and I have very fond memories of a place called Valhalla also known as the Heller estate at Lake Tahoe. 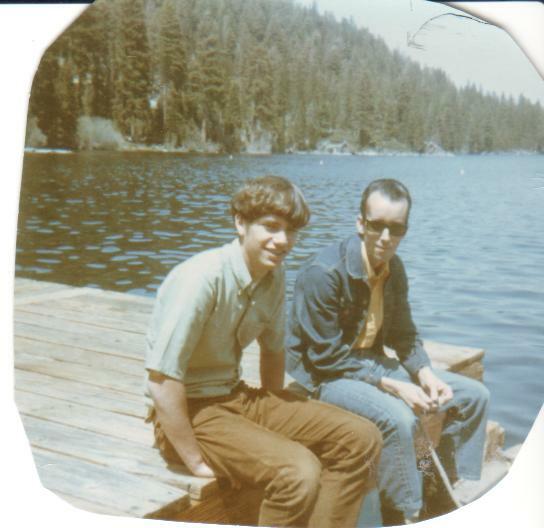 Nick Cimino and Uncle Jack Kelly on the pier at Valhalla about 1970. 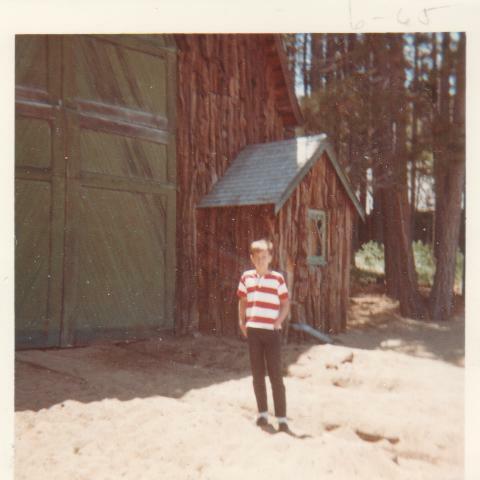 Nick Cimino in front of the boat house at Valhalla, Lake Tahoe, June 1965.